Let's Play! To start the game, randomly place four maze cards in the center of the table to form a square. The remaining maze cards are placed in a pile where all players can reach them. Each player then draws two maze cards and puts them face up in front of them. On your turn, add one of your cards to the growing maze. In order to be able to take a card from the maze, there must be a path formed from one of the treasures on the card you played to a matching treasure somewhere else in the maze. If this is the case, you can take the card with the same treasure as the card you just played and it will be counted as one of your points at the end of the game. However, you cannot take the card from the maze if it leaves another maze card disconnected. If you cannot form a path to a matching treasure with either of your cards, simply connect one of your cards to the maze and draw another card. 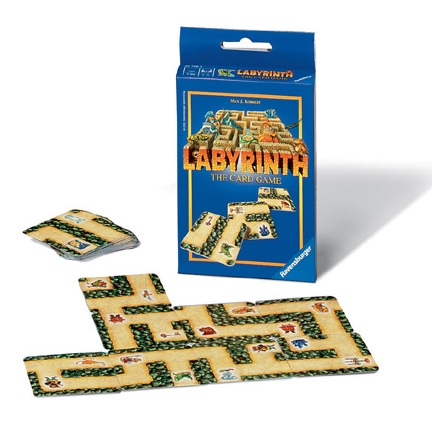 When the card deck has been depleted, the player who collected the most cards from the maze wins the game.